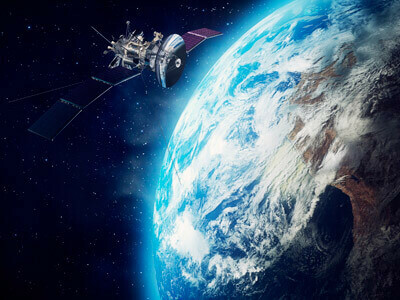 Over the past sixty years, the satellite industry has witnessed significant technical innovations through the incorporation of the latest advances in electronics, communication, Digital Signal Processing and Space Launch technologies. The industry provides numerous services for modern society, which include commercial services, such as data & television signal transmission, and telephony (which are also used for military, governmental, and research applications), as well as serving science ventures such as environmental & climate studies, earth observation, interplanetary exploration, astronomy and solar physics. Earth and Sun Sensors coupled with star trackers and GPS receivers. Visible light cameras with video, near-Infrared imagery and Synthetic Aperture Radar features. S-band and UHF/VHF narrow band techniques for Data Communication. The industry witnessed several changes such as the introduction of constellation satellites & the Low Earth Orbiting (LEO) Satellites and Medium Earth Orbiting (MEO) Satellites; but none seem as fundamental as the introduction of the small sized, low cost, lightweight, standard based nanosatellites. Nanosatellites represent the new disruption in the Satellite industry and are changing the landscape of an industry as a whole. Even with a few nanosatellites in operation (in contrast to traditional ones today), their numbers are expected to rise at a very fast pace over the next few years. With the standardization of size and shipping container, these nanosatellites can be built and launched in groups at a fraction of the cost of traditional satellites; while the latter costs hundreds of millions of dollars, the former only costs a few million dollars and sometime much less than that to be created and sent into space. These innovations have changed the way data can be collected and relayed from space, and with their diverse applications, people have formed teams for different missions and projects, thus creating endless possibilities for new ideas and ventures. By combining inexpensive construction and swarms working together to achieve great outcomes, nanosatellites are set to disrupt the aerospace industry.